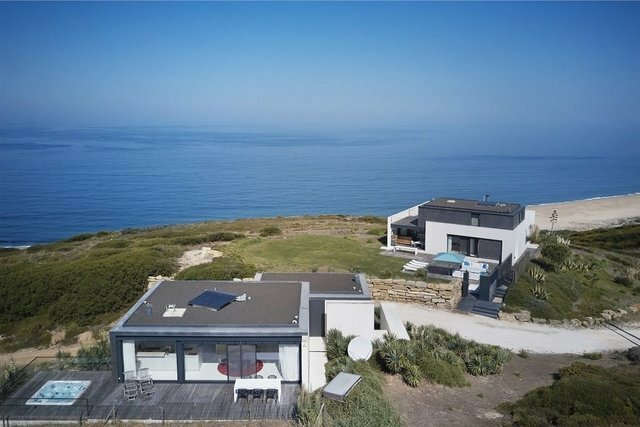 Located in a nature reserve with breathtaking 180º sea views, just above an 8km stretch of beach, this spectacular property is 1h from Lisbon, 2 hours from Porto, only 15 minutes from 3 neighboring cities: Nazaré, Caldas da Rainha and São Martinho do Porto and 3 minutes away from local shops and commerce. Also nearby is the charming medieval town of Óbidos which hosts one of the top golf resorts in Europe. Located on the Atlantic seaboard this area has a very temperate climate. The two chalets are in a modern architectural style and built to German standards. The layout and the finishes of the houses were thoughtfully planned out with the utmost attention to detail. Each one has a full Gaggenau kitchen, cutting edge sound systems, underfloor heating, air conditioning, alarm system. Fully powered by solar panels. The jacuzzi has unbeatable views of the nature reserve and the ocean, an ideal spot to watch the sun setting over the sea. The main house has 1 master suite and the guest house has 3 suites. Both houses have sea views. There is a spacious garage with a full laundry area. There is an architectural project to put in a swimming pool. There is also a full concierge service.